Scientists have an image problem. Women and minorities are often told they don’t “look like scientists” as stubborn stereotypes depict scientists as white, male, and more competent than warm. Instagram, with its huge and growing community of users and obvious capacity to relate human interest stories, represents a great opportunity to address this problem. Paige Jarreau and Samantha Yammine introduce Scientist Selfies, a new project that will test whether by humanising themselves on Instagram and interacting with their followers scientists can enhance popular perceptions. 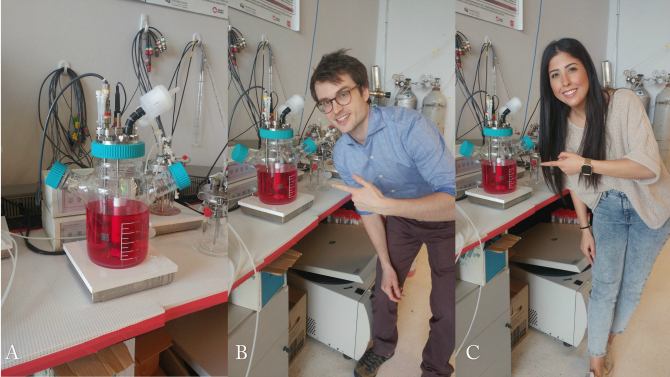 A selection of evidence-based Instagram tips for scientists have already emerged from the project. Instagram is the “hot” new venue for science communication. According to Pew Internet data published in August 2015, 55% of online adults ages 18 to 29 use Instagram. Roughly 32% of internet users are using Instagram, with a high percentage being younger adults and teens. Instagram audiences appear to be more diverse than audiences on Twitter, Reddit or other social networks. With photo and video sharing on the rise, Instagram offers scientists an opportunity to capture people’s attention with visuals and engage audiences in first-person journeys of scientific discovery. Instagram may be an important avenue not only for engaging young adults and teens in science with visuals, but also for helping them to see scientists differently. Scientists are stereotyped as male and more competent than they are warm. In other words, scientists have an image problem in that women and minorities are often told they don’t “look like scientists”; and with scientists generally receiving only middling scores (about a 3 out of 5) on the warm dimension of trust in social contexts, comprising such traits as morality, trustworthiness, sincerity, kindness, and friendliness. Social networks like Instagram could break down stereotypes about how warm (or not) and how diverse (or not) scientists are. Instagram has a higher percentage of female users than other social networks, and has attracted a strong and tight community of #womeninSTEM like @science.sam, @phd_fashionista, @biologistimogene, @stylish_streaking and @pondlife_pondlife who use the platform to share their work and lives as scientists. Female and minority scientists’ presence on Instagram may help change stereotypes about who looks like a scientist, and help recruit a new generation of diverse STEM professionals, especially if viewers can form interpersonal relationships with scientists via comments and interaction. Instagram is also (in)famous for promoting a “selfie” culture. Faces engage us. Researchers at Georgia Tech found Instagram photos with faces are 38% more likely to receive likes and 32% more likely to receive comments than photos without faces. Humans simply make stories more shareworthy. Milkman and Berger found that scientific discoveries referencing people were more likely to be shared, observing a 5% increase in raters’ self-reported willingness to share a scientific summary. Human faces associated with science on Instagram may also help viewers form interpersonal relationships with scientists, something most US adults are starkly missing (most either can’t name a living scientist or don’t know one personally). And, just maybe, selfie culture could help Instagram users see scientists differently, breaking down the stereotypical image of a scientist as male and white. Unfortunately, we know little about how the presence of a human face in images taken in scientific contexts impacts perceptions of scientists in particular, especially in the context of social media environments. We know smiling faces make people appear more friendly, approachable and trustworthy in images, but the effect can be different for different people or different types of scientists, including for men vs. women. Instagram practices (such as posting selfies) may boost the perceived warmth but hurt the perceived credibility of female scientists but not male scientists, for example. “Female academics in the sciences are perceived as less competent and more warm than their male counterparts.” Attractive or feminine women who post self-portraits on Instagram may elicit responses of “But You Don’t Look Like A Scientist!”, reflecting gender stereotypes. As a team of science communicators and #scicomm researchers at Louisiana State University, the University of California, Berkeley, the University of Toronto and the University of Delaware, we’d like to address the gap in research on how scientists’ social media posts can change scientist stereotypes or public perceptions of and trust in scientists. Our new project, fondly called Scientist Selfies, will test whether a series of scientists humanising themselves on Instagram (posting friendly photos of themselves in scientific contexts) and interacting with their followers may enhance perceptions of scientists’ warmth, related to perceptions of morality, honesty, sociability, and openness. We’re working with scientists experienced in using Instagram to create realistic stimulus materials for a series of lab-based and online survey experiments to explore causal links between humanised science Instagram posts and viewers’ perceptions of scientists. We’ve already collected dozens of image series from over 50 real-life scientists to use as our stimulus. We will ask participants to rate the warmth and credibility of the Instagrammers as well as scientists in general, among other related outcome measures, after they browse controlled Instagram content. We expect this project to build scientists’ capacity to foster public perceptions of warmth as well as competence through visual social media posts. We know little yet about how scientists’ Instagram posts, especially ones including pictures of themselves conducting scientific research, may impact viewers’ perceptions and stereotypes of scientists. But while we work toward a greater understanding of any such impact, previous study findings and the personal experiences of scientists on Instagram offer clues as to how researchers can use Instagram more effectively to share science, and promote the sharing of science, among non-expert Instagram users. Below, we offer some evidence-based science Instagram tips. Posts on Instagram have a half-life that far exceeds that of a Tweet, and the visual nature of the platform gives science communicators an opportunity to attract people who may not realise their interest in science. Accessible, creative visuals can increase attention to and understanding of complex science information. Although it can take a while to learn the platform’s nuances, the best way to do so is to dive in and give it a shot. Pay attention to what your audience likes, and don’t be afraid to experiment with new ideas! As long as you’re replacing jargon with helpful analogies, being genuine, and engaging with your audience as best you can, you’re sure to have an impact. The aforementioned Milkman and Berger research found that discoveries referencing people, or using words referencing humans/people, are more likely to be shared. Even if your science doesn’t directly impact people, you can still make stories about your science be about people. One way to do this is to be a character in your own science stories, through both visuals and text. Bring viewers on your journeys, as you experience them, in the lab and field. What motivated you to pursue a particular research question? What does it look and feel like to be you, as a scientist, on a daily basis? What struggles have you faced as a scientist, and how did your perspective change as a result? And don’t leave your face out, even if it feels funny taking selfies with your science. People like to read science stories about humans, and like to see human faces. Remember the Georgia Tech research: Instagram photos with faces are 38% more likely to receive likes and 32% more likely to receive comments than photos without faces. Instagram is something of a mash-up between Facebook and Twitter. Like Twitter, it encourages a greater number of loose ties between individuals who don’t know each other offline, unlike Facebook’s “friending”. But Instagram users, especially younger ones, tend to have private Instagram accounts and interact with others they know or get to know via the platform. Instagram overwhelmingly fosters positive interactions between users. Joe Phua and colleagues recently found that Instagrammers most often use the platform for showing affection, following fashion, and sociability. There’s also evidence that creating social or relationship currency with scientific information or stories online can prompt sharing of that information or those stories with others (Southwell, 2017). In other words, give Instagram users (positive) conversation fodder and opportunities to engage with both you and your science Instagram content. Don’t worry about your number of followers, especially in the beginning. It takes time, but organic growth with real people – no matter how few – means you are engaging people and potentially changing the way people see science and scientists for the better. One good connection can be extremely significant for a high-school student or a patient looking to learn more about their condition. If you don’t have time to be a full-on content creator, you can also have tremendous impact by engaging with other science communicators to help their platform can get off the ground. Supporting other scientists and science communicators is the best way for us to all reach our long-term goal of sharing science. Science stories are more understandable, interesting, and engaging than scientific information that doesn’t exist within a narrative structure (Dahlstrom, 2013). Narratives are intrinsically persuasive, and can make scientific information much more compelling. Tell stories in order to capture and keep your audience’s attention, through both your Instagram images and captions, or through short videos. Science Instagram posts that garner the most likes and comments are often striking visuals or curious videos combined with a story of what’s happening, how that visual came to be, or the creator’s motivation for sharing and doing science. Stories have plot, characters, suspense and conflict. But at their core, they’re about internal change within characters. In great stories about science, the adventure, the scientific discovery, the journey in the science lab or field to answer an important research question, leads to an internal change as the result of conflict overcome. For greater impact, tell a story that elicits a “flow” of different emotions throughout the story (Nabi & Green 2014). 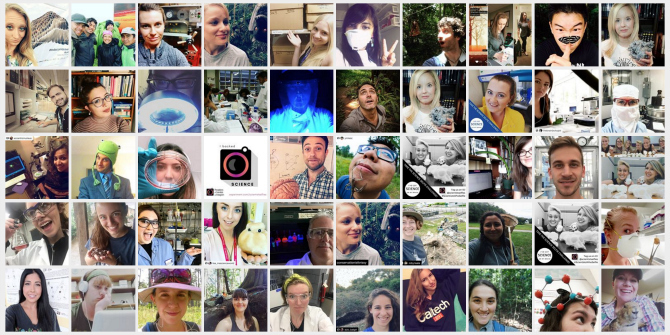 Stay tuned for results of our study on public perceptions of scientists who Instagram… and selfie! Our team, including Dr. Paige Jarreau, Dr. Lance Porter, Daniel Toker, Samantha Yammine, Imogene Cancellare and Dr. Becky Carmichael, is currently crowd-funding our research project through Experiment.com, and we would love your support. 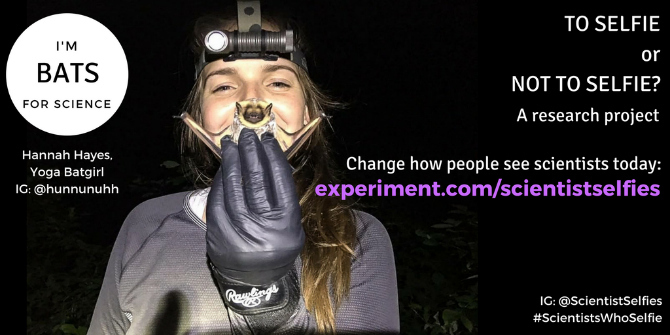 Pledge at experiment.com/scientistselfies to stay updated on our research progress, receive regular tips and tutorials on how to use Instagram to share science, and claim various backer perks! You can support our research in other ways too, by sharing this blog post and participating in our #ScientistsWhoSelfie Challenge! Follow us on Instagram, @scientistselfies. Paige Jarreau is a science communication researcher specialising in social media. She’s also an avid blogger (fromthelabbench.com) and Instagrammer. She Instagrams science @scicommnerd and @lsuscience. In her day job, she works at the Louisiana State University College of Science and LSU’s Communication across the Curriculum Science Studio. Find her on Twitter @fromthelabbench. Samantha Yammine is a stem cell biologist and neuroscientist at the University of Toronto, where she is researching how stem cells build and repair the brain for her PhD. Samantha is passionate about sharing her love of science with everyone in order to foster support for science research, encourage more interest in STEM fields, and change the stereotype of who can be a scientist! She shares her PhD journey and favourite stories about science on Instagram, @science.sam. More info about Sam can be found on her website heysciencesam.com.